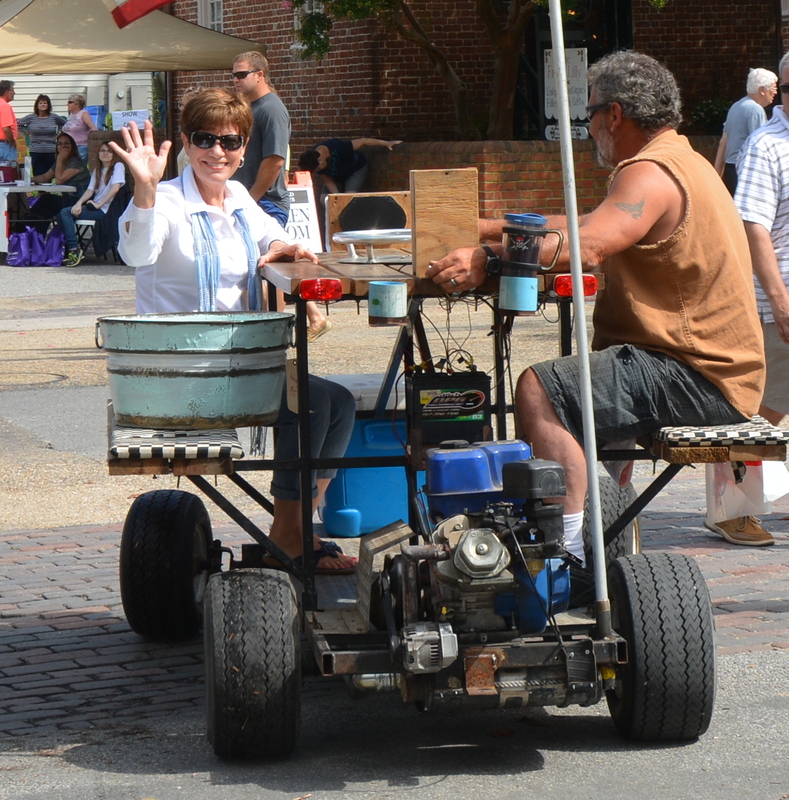 As I mentioned in Friday’s Random Five post, this past weekend was the Olden Days “festival” in our little town. And although the weather forecast was bleak, we actually had a very nice weekend. The storms didn’t come until late Saturday afternoon, allowing most of the activities to take place under sunny to partly cloudy skies. As in years past, the kickoff for the weekend was a free concert on the “town square” Friday evening by a local oldies band, The Rhondells. After waiting to decide exactly exactly what the weather was going to do, my friend, Donna, joined us. A few minutes after she arrived, Liz, a former classmate of ours, who lives about an hour away, texted me to say that she and her husband were also there. All of a sudden, it was an impromptu mini class reunion. 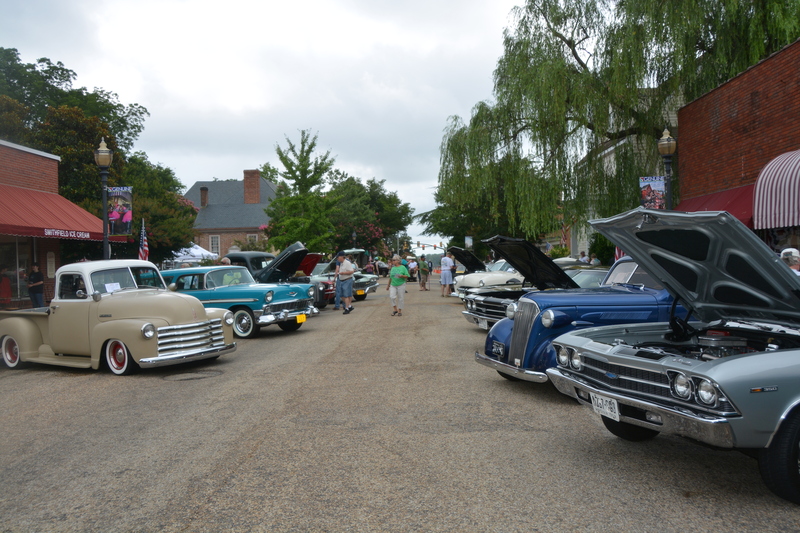 Saturday morning, after breakfast with Motor Man, Donna and I took in the Farmers Market, Vintage Alley and classic car show on Main Street. The skies were overcast, but no rain. This “rat rod” has an engine built by my Motor Man. My adventure began after purchasing this neat old wash tub at the vintage market. Now, you may think that I’m sitting on a picnic table in the above picture. But, actually, that was my transportation (after my wash tub purchase) back to where my car was parked. On our way to my car, someone told my driver that he needed to make his way down the street to the location where the kids’ bike parade was beginning. They wanted him to LEAD the parade. And he asked me if I’d like to ride. So we dropped off my wash tub at my car, and away we went. (No, I don’t have photos of that, because I’d left my camera with Donna.) And, since I’d taken off with a stranger driving a picnic table on wheels, she was mighty worried when I took so long to return. All in all, a fun weekend. There’s just nothing quite like living in a small town. 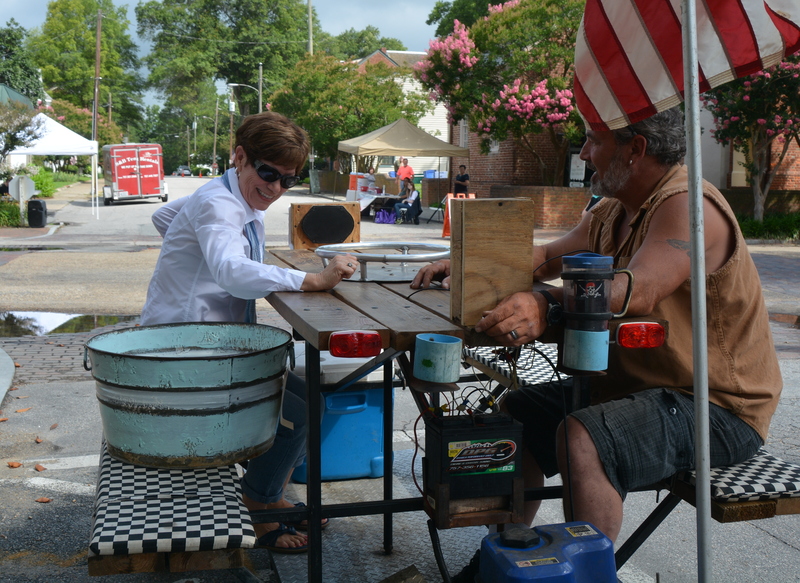 This entry was posted in Family, Traveling Days and tagged car hop, classic car show, galvanized wash tub, olden days festival smithfield va, picnic table on wheels, rat rod, rhondells concert smithfield va. Bookmark the permalink. It was the BEST weekend! And to think I came a millisecond from writing it off because the weather man’s forecast. The Friday night concert under cool breezy skies with the Rhondells and watching children and adults alike shag, getting to meet your new lovely swan the next morning and head back downtown. It really showcased the best a beautiful clean historic small town had to offer and I loved every minute (even though when Dianna tore off on a mobile picnic table….) the best part was being with Dianna Motor Man and sweet Sundae. They even freshened my clothes with lavender balls! Oh what fun! Good thing the weatherman was WRONG. 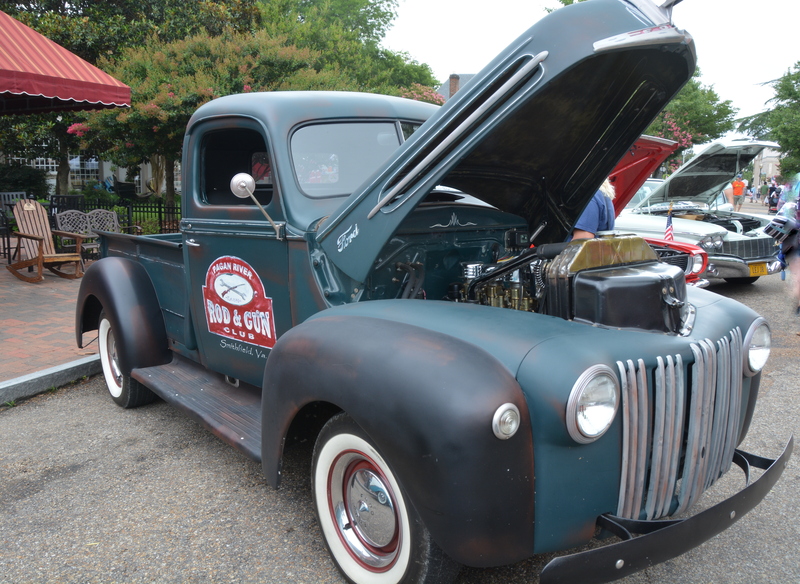 That picnic table transport is hilarious…..the old cars look great – David would have loved that part. 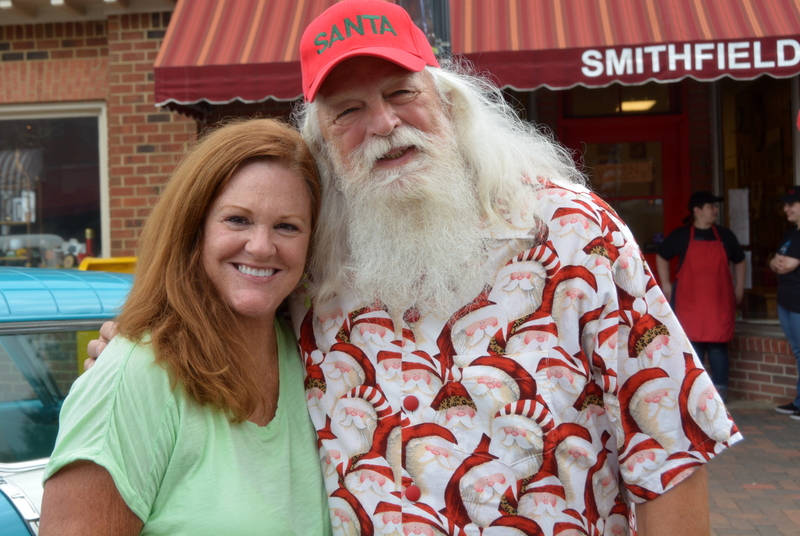 All in all, a most fabulous “olden days” in a small town – there’s just nothing like it. It sounds like the perfect weekend….but you didn’t mention my favorite owner of a classic car!! June , I got to meet you wonderful son, see his race winning beautiful car! He drew a crowd of children with big eyes looking at his album of racing pics, and the attributed his love of racing to his aunt, Dianna! What a great weekend, Dianna. 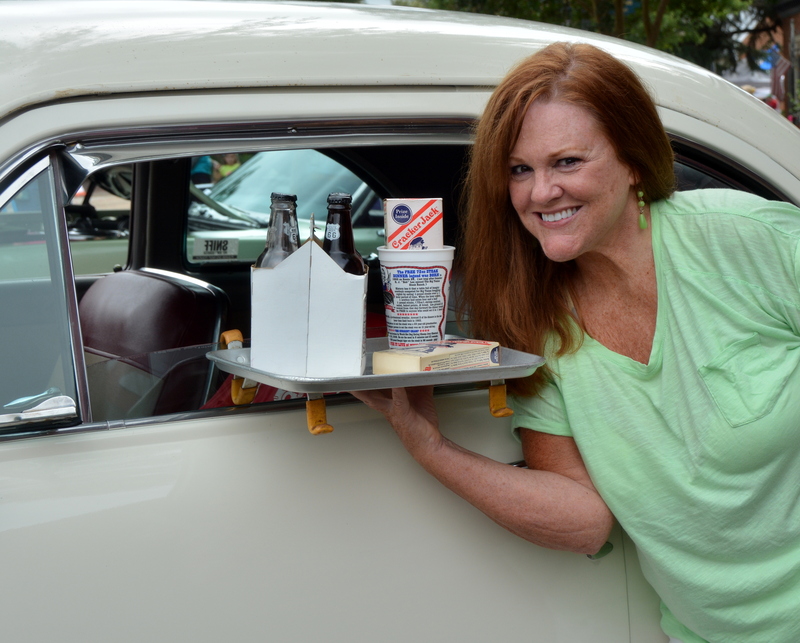 I love the photo of Donna working the car hop…so cute! I am so glad that the rain held off until things were mostly over. You certainly got ‘the ride of a lifetime’, didn’t you? Too much fun!! Oh what FUN!!! I Laughed Out Loud when I saw the picture of you ‘riding the picnic table’. That’s got to beat anything I’ve ever seen on wheels. We do have a GREAT small town, don’t we? I’d have to agree: not too many places where you’d have a chance to do that ! What a Great Ride! A Great Time, Great Friends and Great Find!!! One of these years, Chuck and I are going to make it to “Olden Days” looks like so much fun. 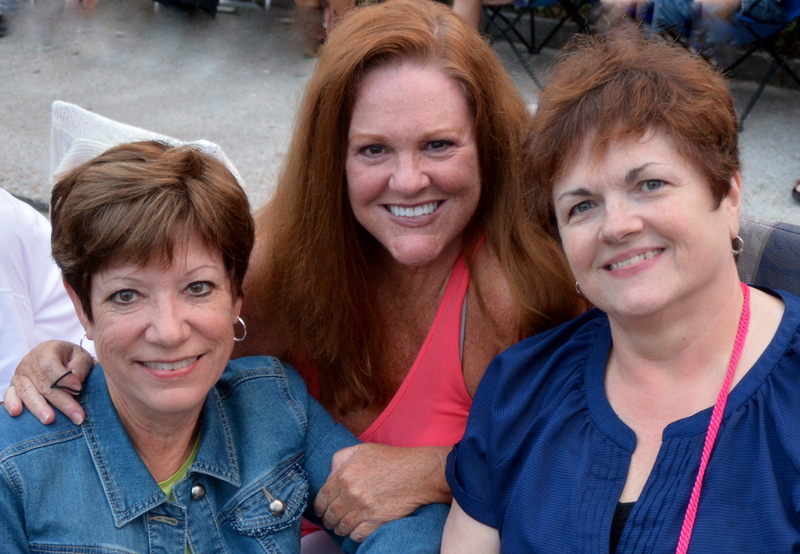 Great picture of you, Donna, and Liz and love your wash tub. I have a feeling it will be filled with plants soon! The picnic table ride is a trip! Donna would make a very pretty car hop. Fun for all. I love the picnic table on wheels. Just brilliant. Small towns are the best! Looks like you had a blast. Nice wheels too! Oh my how stinking fun was that!? The wash tub is gorgeous and I wish I could’ve heard that motor! I bet it sounded awesome. What a cool ride! We saw a ride, I think in Savannah. There appeared to be a long table in the center, people all along both sides, and pedaling to make it go. It appears to be used for bar-hopping now that I looked it up!